SPINNING is a method of forming sheet metal into seamless, axisymmetric shapes by a combination of rotation and force. On the basis of techniques used, applications, and results obtainable, the method can be divided into three categories: Manual spinning , Power spinning, Tube Spinning. 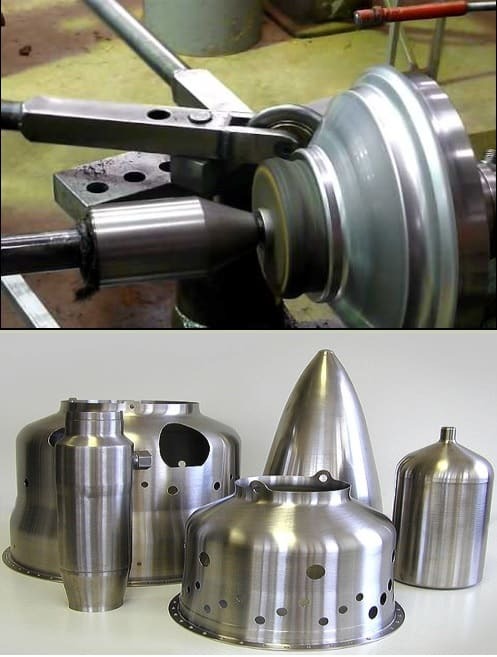 Manual spinning is used to form flanges, rolled rims, cups, cones, and double-curved surfaces of revolution (such as bells). Several typical shapes formed by manual spinning are shown in Fig. 1. Products include light reflectors, tank ends, covers, housings, shields, and components for musical instruments. Manual spinning is also extensively used for the production of aircraft and aerospace components, often with mechanical assistance for increased force. Practiced by pressing a tool against a circular metal preform. Involves no significant thinning of work metal; essentially a shaping process. Used for prototype manufacture or in production runs less than 1000 pieces. Metal is deformed using high shear forces. Use of automated CNC machines. Significant thinning of metal preforms. Thickness of cylindrical parts reduced by spinning them on cylindrical mandrel rollers. This step involves the laying down of the material onto the mandrel. Parts having been spun are trimmed at the end to blunt sharp edges and also to bring the component to the desired length. Finishing is done at very high RPMs (1200+) so that a minimum of force need be applied and verysmooth strokes can be used. The flat side of Duckbill spinning tool is used for straight surfaces an rounded side for curves and radii. They are also specified by the maximum load that can be applied to the work. The capacity of spinning machines ranges from 0.455m in diameter and 0.380m in length to 6m in diameter and 6m in length. Metal spinning machines can be both vertical or horizontal. Machines used for spinning large diameters, such as 1.8m or more are usually vertical. Mostly lathe based machine tools ( both conventional and CNC-based) are employed for spinning operation. Most modern machines used for spinning are at least semi-automated; that is, they are loaded and unloaded by the operator, but the entire spinning cycle is controlled automatically. Vases, baskets, basins and bowls. Bottoms for tanks, hoppers and kettles. Housings for blowers, fans, filters and fly-wheels. Ladles, nozzles, orifices and tank outlets. Funnels, cylinders, domes and drums. Vents, venturis and fan wheels.